The weather in Volcano Village is different compared to most places in Hawaii. The village was built at an elevation of almost 4000 ft. (1.3 km) on the slopes of Mauna Loa. This means that it is more prone to cooler and cloudy weather than most other places on the Big Island. 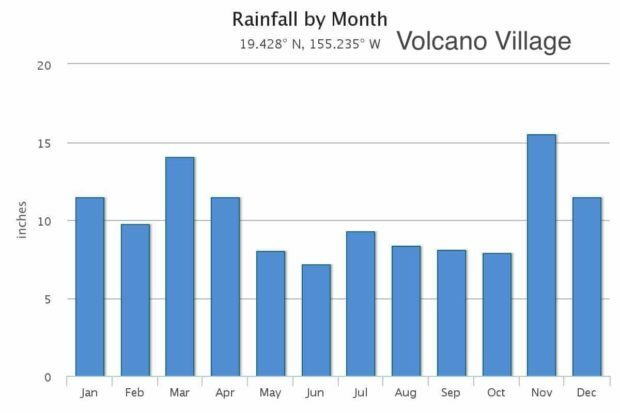 You can see this in more detail below, where we present you the yearly averages for Volcano for the temperature, the precipitation and the number of cloudy days. 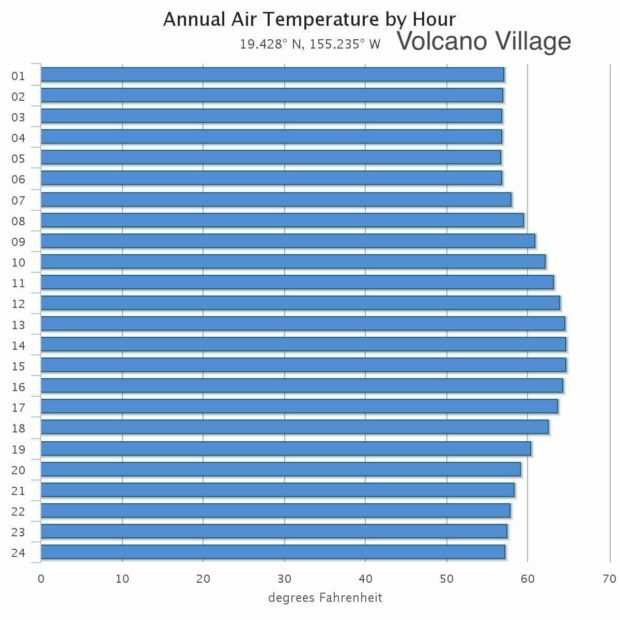 Volcano Village weather in a nutshell: on average it is 10 degrees (Fahrenheit) cooler here than in Kona, so the evenings can be cool: bring a sweater. It also may rain so take a light raincoat, but also expect sun. When it does rain, remember that the rainforest looks as amazingly lush as it does exactly because of the rain. In short, be prepared! Learn about weather on the Big Island. Best time to visit Hawaii, monthly + yearly temperature, rainfall, cloud cover, trade winds and wet side vs. dry side. 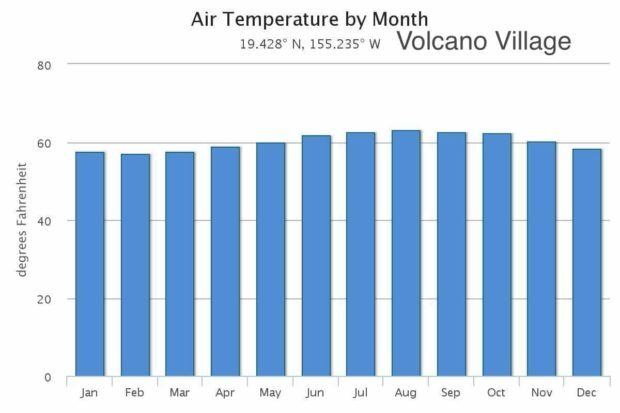 The monthly average temperatures in Volcano Village range between 57°F (14°c) in February and and 63°F (17°c) in August. These temperatures are averaged over the whole day, and the average temperature fluctuation between day and night in Volcano is about 7°F. This means that the average maximum temperatures year round are between 64°F and 70°F (18 and 21°c). These are perfect temperatures for exploring the Hawaii Volcanoes National Park without getting to hot. The air here is often humid, so especially in the early morning and late evening/night it can feel cold. Take warm clothes to be prepared for this. 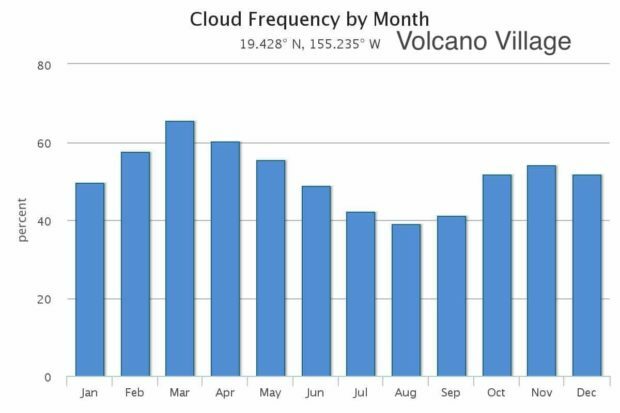 The monthly average temperature (left) rainfall (middle) and cloud frequency (right) for Volcano Village, Hawaii. See the “Sources” section below for image credits. Volcano Village can be a very wet place: it receives on average 3 to 5 times more rain than the US average. November through April are the months with the most rain and cloud cover. If you absolutely don’t want to see rain while you are in Hawaii you should check the local weather forecast and plan your 2 days to Volcano Village accordingly. For everybody else, you will probably see some rain and some sunshine. There are lots of cozy vacation rentals with fireplace and hot tub in Volcano Village, Take a raincoat and your swimming suit, and enjoy yet another face of the Big Island. There are large differences in cloud cover throughout the day. You will have the most chance to see the sun in the morning between sunrise and 6 am, after which the chance of clouds increases rapidly. After noon the sky will be overcast on average 7 out of 10 days. 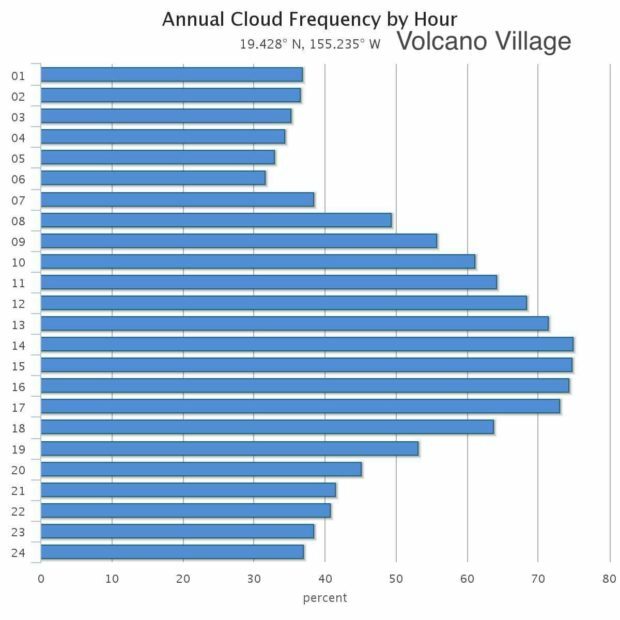 The hourly average amount of cloud cover (left image), and temperature (right image) for Volcano Village on the Big Island of Hawaii. See the “Sources” section below for image credits. All the information on this website deals with average temperatures, and it is very likely that the day-to-day weather deviates from these numbers. If you are interested in the current weather conditions and weather forecast for Volcano, please look up the NAOO forecast. we summarize all the information above in the following table in which you can find the monthly averages for the air temperature, the amount of rainfall, and the percentage of cloud cover. Giambelluca, T.W., X. Shuai, M.L. Barnes, R.J. Alliss, R.J. Longman, T. Miura, Q. Chen, A.G. Frazier, R.G. Mudd, L. Cuo, and A.D. Businger. 2014. Evapotranspiration of Hawai‘i. Final report submitted to the U.S. Army Corps of Engineers—Honolulu District, and the Commission on Water Resource Management, State of Hawai‘i. 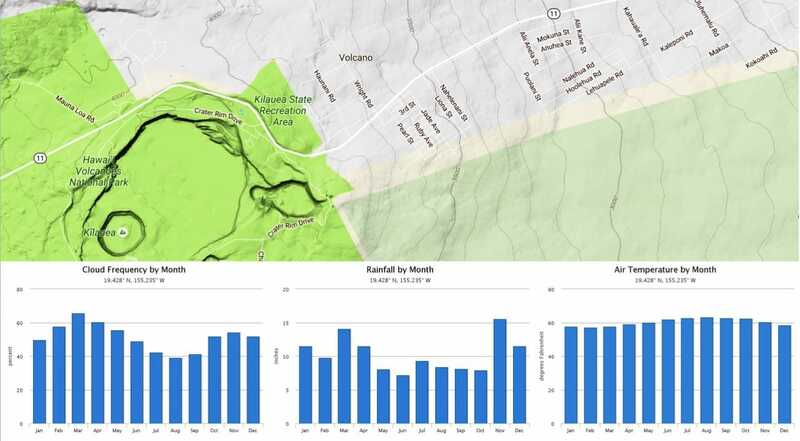 The data have been downloaded from the Climate of Hawai’i website, which provides a set of maps of the spatial patterns of climate for the major Hawaiian Islands.